In the Pryors, I sometimes find horses missing from their harem. Sometimes I find them with a different harem, and sometimes I just can’t figure out where they are. If they aren’t seen for a year, then they are believed to be deceased. This of course changes if their remains are found, but it can be difficult to find a deceased horse. Recently, though, I found two of these horses on the same day. I found one by hiking out to an area I saw a lot of ravens at. As I got there, I realized it was Wounded Knee, a dun mare that had been with Teton. Wounded Knee was one of my favorite mares. She was born in 1992 to Froggie and Froggie’s dun mare. Though she ended up living as a Burnt Timber horse with Teton, she started out as a Dryhead horse with Sir Lancelot. I couldn’t see anything too obvious about why she died, but she had been looking very healthy before she died. I am very interested in the genetic representation of the horses in the herd, and she has been one I was hoping would foal again because she only has one offspring on the range and this is her only offspring to have reproduced – Merlin. Atlantis is a mare that was with Duke. In October, I found her and her foal to be missing from Duke; and I just couldn’t find her at all. I now know that she, and presumably the foal, died. She died a short distance from Wounded Knee; we found her walking back with Wounded Knee. There was not much left of her, but there was enough there for me to know who it was. Atlantis was born in 2001, and so she was a younger mare. I couldn’t tell why she had died from her remains. But the Pryors aren’t just a place of death, there is also a lot of new life out there, especially this year. 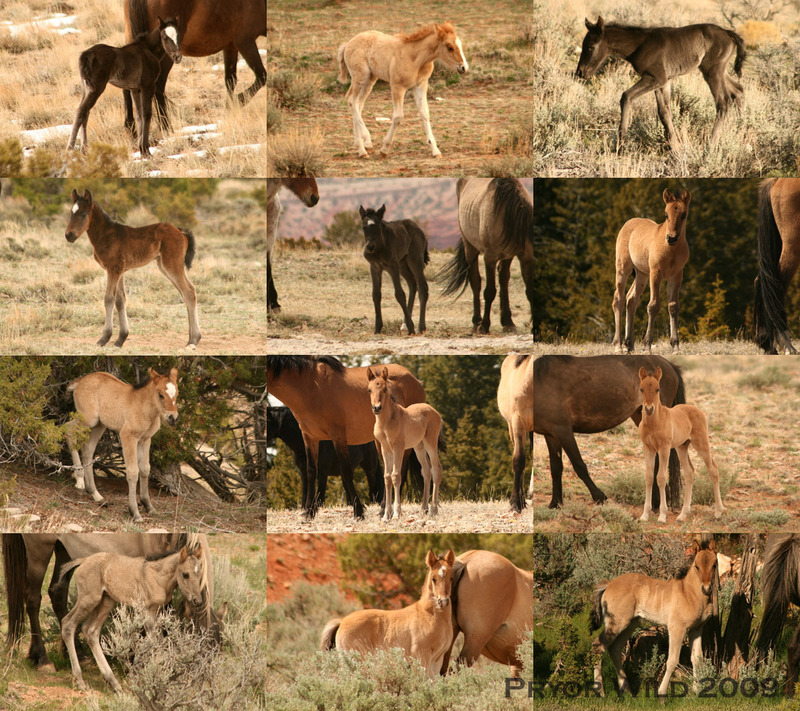 I’ve found 14 foals to be born thus far, and here is a photograph of 12 of them (the other 2 I have only been able to watch with a spotting scope thus far). Please click on this photograph to get to the bigger version of it. There are still a number of pregnant mares out too, and so we are far from the end of this year’s foaling season.